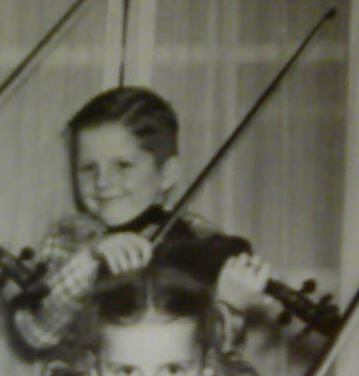 So I started with a new violin teacher this week, very cool guy who plays really well. Better than I at least. 1.Posture - I slouch, no two ways about it. So its standing up practice for me, and should I sit; standing up posture from the waist up. No more practicing whilst reclining on pillows "bedouin style". That was my favorite part of practicing too. Also, chest out shoulders back in a relaxed posistion instead of hunching forward and together. 2.Bowing - I still need to use more bow. I use maybe a third of it so Im focusing on fixing that this week. 3.Tone - Of course intonation is important but mines not far off, fine tuning for me. Sounds pretty basic right? Well after two years of self teaching it reminds me of what I post alot. Get the basics right first and you wont have to go back and fix them. So Im going back and fixing some things I couldve learned better. So if youre just starting pay attention. Let you know what he says next week. Thanks for the tips so we can check ourselves from the beginning. For me, I think I just need to remember the difference between straight/curved, up/down, and left/right - lol - and then apply these great tips. New teacher ? What happened to the "old coot"..
Just kidding, Rob, there's some thing's to be preaware of. So I started with a new violin teacher this week, very cool guy who plays really well. Well after two years of self teaching it reminds me of what I post alot. Get the basics right first and you wont have to go back and fix them. So Im going back and fixing some things I couldve learned better. So if youre just starting pay attention. Congrats on having a teacher. I'm happy for you. You're absolutely right about the basics. During my 6 month learning, I had to go back to the basic so many times. I've spent last couple of days just relearned bow holding again, and not even complete any single tune yet. Hopefully it will come sometimes. The old coot lives too far away, now that I am sans vehicle. This younger gentleman is low cost enough for me to justify as long as I am learning something. I will follow his advice and give it a fair shake. so far so good. now if I can just improve. Going to see the teacher tommorow. I have practiced everyday and am still struggling with multinote multi slurs, hooked slurs etc. This is like pattin my head and rubbin my tummy kind of skill. I will let yall know what he says about it. The tunes are in the Suzuki 2 book, Chorus from Judas Maccabaeus - Handel. and Musette - Bach. I did good on my assignments and now I have to work on playing LOUDER so there is some contrast in my dynamics. So the checklist is Posture, Bowing, Intonation and now Dynamics. PBID = peanut butter is delicious. ha ha. I am waiting to do my christmas video until I get as much better as possible. So his tip this week was to treat what I think of as Forte as double forte and what I think of as Piano as double piano because what I hear is different than an audience so the contrast needs to be ovious. So this week I have to play as loud and with as much pressure as possible to be comfortable controlling the bow and where to bow, closer to the bridge. Today was fun. It felt good to not come up short er or to meet expectations. A method I use to develop my 'dynamics' is to play along with a piece on the stereo where I can raise the volume to the level that you hear more recording than me... I back it off a touch and then play like I want them to hear it in the back of the concert hall! You'd be surprised at how well your violin will sound when you 'hammer' that bow across those strings with authority! I like it, I like it alot! ha, ha. The first thing I noticed was how free I felt to use the whole bow when playing loudly. Definately something for people to investigate to see if it applys in their own playing. To achieve an audible forte play a fortissimo and to achieve a piano volume, play pp. I like it, I like it alot! ha, ha. The first thing I noticed was how free I felt to use the whole bow when playing loudly. Not free as much as compelled? You almost have to use the whole bow in order to play as loudly as possible. Then after you have learned to use the whole bow, you are free to use the whole bow even when not playing loudly. Or so it seems to me. Week Three- I passed the dynamics test, but I'm not off the hook yet. Playing dynamically, following bowings, slurs etc is making my brain go in too many directions! Add to that a better bow hold and focusing on making my wrist flex properly and I am having some Yeehaw moments followed by some aw crud moments! Spending the week in front of the mirror to monitor myself. I hope to be as fluid as Naska! Make sure your wrist is flexing as it should, that combined with a proper bow grip will keep your bow straight and solid. Practice in front of a mirror! ...Spending the week in front of the mirror to monitor myself. I hope to be as fluid as Naska!.. My teacher said that we will fix my fingers much later - it's not so big deal. But wrist is bad and i should work on it harder. Relaxing+have steady tone+Straight bow is quite tricky. So first of all try to bow with ALL amount of bow. Even if You play just open strings. And then increase the speed with the full bow strokes. Observe quality of tone and free the wrist. This is the one thing i find helpful. sounds like our teachers are all on the same page. We will improve together, eventually. lol. From now on I shall avert my eyes! I think you play great by the way. Not a tip, Im seated at the far end. 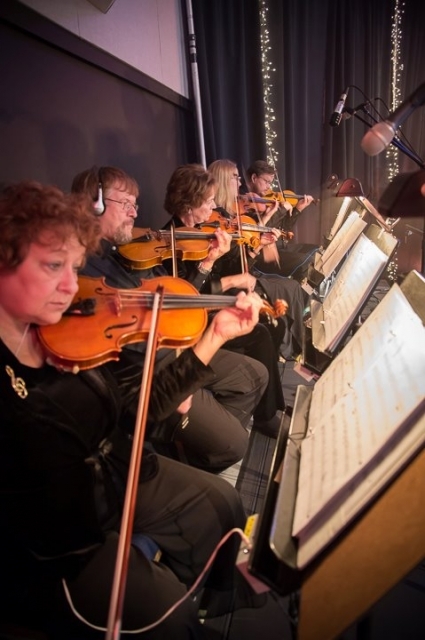 Its our violin section at the christmas performance. This was during the last dress rehearsal. So, Rob, why didn't you tell us your mom is in the pic too? Moms not in this pic, shes playin oboe two rows ahead of me. Picklefish: I just shared the pic of my momma playin. shes in the middle if you see it. Sorry, I guess I misunderstood. I read what you said in the shout box and thought your mom was in the pic. The mirror is apparently an old classic. But these days, many folks do have some sort of a device that can shoot at least low grade video. Video has some advantages over the mirror in that you can focus on your playing first and then check your form after. You don't have to divide your attention as much. The mirror is still probably best for actually correcting form, though, since finding things you can see where you feel you can do better is only part of the process. Guitarists and singers in pop/rock bands also use the mirror for practice for another reason. Working on your presentation and performance. The sound and playing "right" is only part of a good performance. Live music has a visual element that the audience is looking for, and at some point you have to work on that as well.